Laura Devendorf is an Assistant Professor of Information Science and a Fellow of the ATLAS Institute. She directs the Unstable Design Lab, which explores how technological systems can embrace nonlinear, messy and otherwise uncertain terrains of everyday life to provoke critical reflection and curiosity. 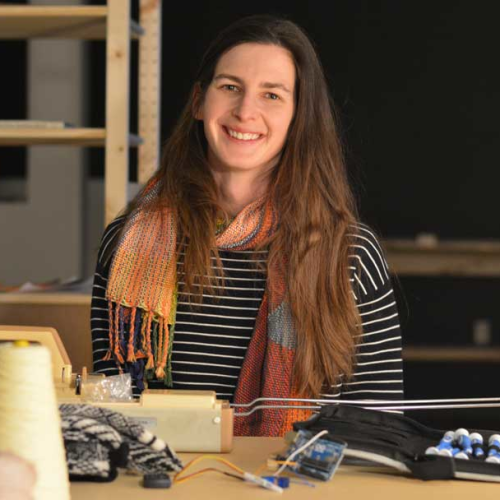 Her background is in art and computer science and she uses both methods explore new design territories in domains like digital fabrication and dynamic textiles. She received her PhD from the School of Information at UC Berkeley in 2016, and her research has received multiple best paper awards at top conference venues in the area of human-computer interaction as well as press coverage on Gizmodo and National Public Radio.